Happy anniversary to the blog! Five years after my very first post in the blogosphere, here I am. I still don't know how I made it this far and what made me this popular over the years, but I really owe it all to you! I've been blogging for the past five years because of the games that I love, but also for your entertainment; to keep the flame ablaze in your hearts and the interest in the games afloat. Your feedback and constructive criticism have always been wondeful and greatly appreciated, and your continued support is a blessing. Thanks for sticking with me through thick and thin, thanks for your devotion and your interest in the blog, but above all else, thanks for giving me a chance to express myself through Frostcaller! 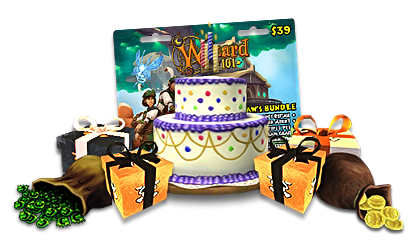 Since June 5th, 2012, I've covered weekly news from around the Spiral, featured a few blog posts from guests, co-hosted several in-game parties with other Community Leaders, such as the Halloween Run, released over 30 unique wallpapers for both Wizard101 and Pirate101, launched many helpful guides, including my popular Guide to Promotional Wands & Staffs and Illustrated Guide to Teleport Tapestries, that I will update very soon with the missing tapestries from the Mirage update, and wrote theories about the remainder of Arc 3 in my Wizard101 Chronicles, Part 1 and Part 2. You may have noticed that I've added direct links to KingsIsle's mobile games on the blog as well, so if you haven't had the opportunity to test them yet, please give them a try! I've been working on new wallpapers that I'm not ready to reveal just yet. However, I can tell you that I will be releasing new Astral and Shadow magic wallpapers later this year, and I might make new ones for Pirate101, too! To celebrate the blog's anniversary, I want you to draw my Wizard101 character (pictured on the right) celebrating his birthday, using any mean you want (digital drawing, pencil drawing, etc.). This contest starts now and ends on June 29th, 2017, at 11:59PM CST. To enter, send an email to [email protected], with the title "Drawing Contest", and your drawing along with your Wizard's name (such as David SilverHunter) by the deadline. Winners will be announced on July 1st, 2017.